The release of the J.J. Abrams film Super 8 is bringing renewed attention to the popular film format which millions of families captured their home movies on during the 60’s, 70’s and 80’s. The format gave a vehicle for today’s most beloved filmmakers to experiment with a home movie camera that proved to be the gateway to some of the most prolific careers in filmmaking. Directors such as Steven Spielberg, George Lucas, Oliver Stone, Sam Rami, Tim Burton, Francis Ford Coppola, and Ron Howard, among others, have all launched careers that have roots in Super 8 film. As kids, they picked up the family Super 8 camera and saw it as much more than a tool to make home movies. They used Super 8 as a production tool to experiment with a craft. This is the theme that runs through J.J. Abrams film Super 8 – a group of kids who were making a real independent movie for a film festival with a Super 8 camera. While the general belief is that the Super 8 format died an honorable death with the advent of consumer and pro-sumer video, Hollywood insiders and savvy independent filmmakers know that the power of super 8 film is alive and well in Burbank, CA! The company Pro8mm (formerly called Super8 Sound) has been working on over 1,000 professional projects every year since the mid 1980’s. Pro8mm hit its heyday in the 1990’s, working on every episode of VH-1 Behind The Music, Where Are They Now, and numerous MTV shows and specials. More recent music videos have been shot on Super 8 film for such artists as Katy Perry, Beyonce, Christina Aguilera, Harper Simon, McFly, and John Mellencamp. Commercials for consumer products such as Ford cars and trucks, Swiffer, Home Depot, Billabong and Roxy, as well as inserts in TV shows such as American Idol, 48 Hours, The Grammy’s, and My Name Is Earl have all embraced the Super 8 format. Additionally, 35mm theatrical releases such as Super 8, My Sister’s Keeper, and Factory Girl have incorporated Super 8 inserts to create the sense of flashback scenes and vintage moments throughout their feature films. This list is just the tip of the iceberg for professional applications that the Super 8 format has worked particularly well for. Additionally, Pro8mm specializes in the HD archival transfers of homes movies and historical films for use in museums, documentaries or the personal archives of the worlds most famous faces. Pro8mm’s projects include the Hewlett-Packard Family and The Estee Lauder Family, The Richard Nixon Library, and tour footage from The Eagles “Hell Freezes Over” tour. Pro8mm has also transferred the first films of many famous directors and cinematographers. Pro8mm focuses on a hybrid of products and services that make it possible for filmmakers to do professional production work with the Super 8 format. Pro8mm turns its work around very quickly, sometimes even the same day. All services are on-site, including a retail store for purchasing or renting cameras and film, the processing lab, camera technicians, and the scanners, which digitize the film in 1080 high-definition to a hard drive for ease of editing. 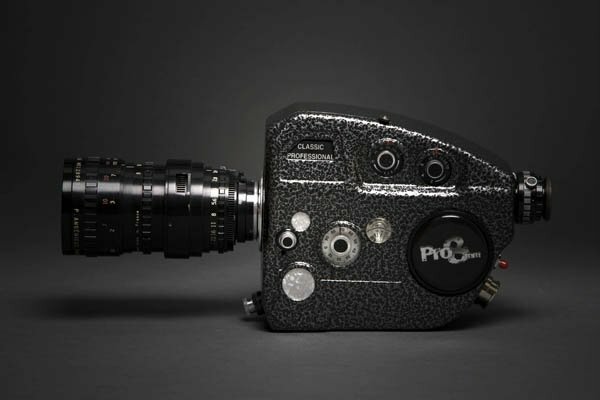 Pro8mm rebuilds classic Super 8 cameras with modifications that a modern filmmaker would want, such as 16:9 aspect ratios and sync sound. Pro8mm also reformats over 20 different Super 8 film stocks, cutting down Kodak and Fuji 35mm film. This gives cost-effective access to the same film stocks being used to make Hollywood blockbusters. 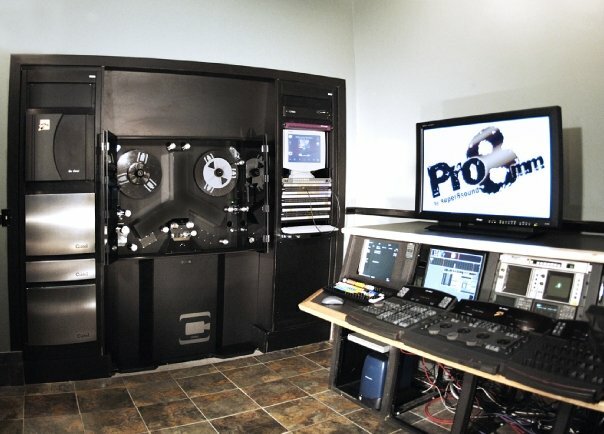 Recently, Pro8mm invested over one million dollars in a Millennium II, 4K scanner, with daVinci 2K color correction, custom modified for Super 8, regular 8 and Max 8 formats. This is the same type of scanner you would see at a high-end 35mm post-production facility. Over the past two years, Pro8mm has made a monumental commitment to educating the next generation about the benefits of shooting on Super 8 film. In 2010, Phil Vigeant, President of Pro8mm, wrote a book titled, “The Power of Super 8 Film – Insider Secrets Every Filmmaker Should Know.” The book focuses on why the pros use it, love it and keep it a secret. Phil gives his expertise on the format and explains why he invented products that change the way filmmakers and the entertainment industry use Super 8 film. Additionally, Pro8mm has launched a series of free teleseminars that focus of Super 8 applications and technical information about the process. Pro8mm has expanded their educational products by offering free hands on film shooting workshops at schools, major industry events and even private workshops at their shop. Pro8mm also hosts their own 2 day Super 8 training workshop, where Phil Vigeant gives in-depth technical sessions on Super 8 filmmaking, and guest speakers talk about and show samples shot on Super 8 film of the many applications of Super 8, such as weddings, commercials and music videos. Founded in 1971 in Cambridge, Massachusetts, the company, which was originally called Super8 Sound ™, pioneered the belief that the Super 8mm film format had tremendous potential as a production medium. History Of Super 8 Sound . A small group of inventors and entrepreneurs designed a line of specialty sync-sound full coat (audio tape that has sprocket holes) and cassette recorders, editing benches and crystal sync modifications to Super 8 Cameras and other production accessories. The idea was that you could replicate 35mm filmmaking using Super 8 equipment. This indeed made the Super 8mm film format and Super8 Sound ™ an integral part of hundreds of university film programs worldwide. Film programs could teach in double system filmmaking on cost efficient super 8. 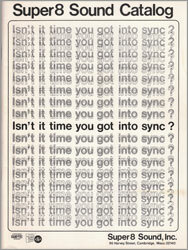 It became widely used by individuals with a desire to make independent films. In 1982, Super8 Sound employee and staff accountant Philip Vigeant had the opportunity to buy the company. In the years that followed, Vigeant bought out other small companies in the Boston area including a film lab and a camera repair shop adding their services to Super8 Sound™. A film chain telecine which transferred film to videotape was also added that year with the firm belief that the future of small format film laid in the ability to integrate it into the video arena. An in-house publication called The Independent Producer was launched which focused on the success of the independent film scene, focusing on people who were shooting on super 8. The magazine highlighted the stories of individuals making low-budget super 8 music videos and film for video distribution. In 1987 Super8 Sound expanded the business by opening a second office in Hollywood, California. This expansion was driven by the amount of clients the company had on the west coast who were involved in producing MTV style music videos for their bands. In 1989, another expansion was implemented to a larger Burbank location, adding a technical camera repair room, on-site processing lab, and film to videotape transfer services. Now a complete turnkey, one-stop shop, the company redirected it’s focus to meet the demands of their growing list of studio and industry mainstream clients. The Boston office was eventually closed in 1995. The Rank Cintel telecine suites with daVinci color correction were added, permanently eliminating film chain consumer quality transfers. One of the biggest innovations for the company came in 1993 with the development of a line of Pro8mm negative film. Prior to this, only reversal super 8 film stocks were available from major film manufactures such as Fuji and Kodak. The idea was that a line of professional film stocks in the familiar easy to use 50-foot preloaded cartridges would offer a palette to filmmakers allowing for greater creative options for the cost efficient, highly portable super 8 format. The company developed a manufacturing operation on-site to cut and reformat professional 35mm film stocks, loading it into super8 cartridges. All-inclusive packages were offered so that film, processing, and telecine could be prepaid, allowing for better targeting of the production budget. The industry, students, and independents embraced this concept with huge enthusiasm. Today Pro8mm has an expansive line of over 20 reformatted film stocks that range from 50-500 ASA and 3 different scanning systems, including high-definition. In addition, they repackage Kodak Super 8 film stocks to include their award-winning processing and HD scanning services. Over the next 10 years thousands of projects were shot on Pro8mm film including dozens of episodes of VH-1 Behind the Music, hundreds of commercials, segways for prime time television shows, and scenes in theatrical releases. Pro (in favor of) 8mm. The days of sound on film and mag full coat recorders were gone and the new direction of the company would be to integrate the small format film into the digital world. Profound changes were to follow to bring Super 8 into the HD world. In 2003 Pro8mm expanded the small format product line to include Pro16mm, loading 16mm film onto 100’ daylight spools, rebuilding classic 16mm cameras and expanding our processing and telecine services. Aligning with prosumer and industry trends, 2005 brought Pro8mm into the widescreen era with the introduction of Max 8, a 16 X 9 widescreen super 8 camera and scanning system. Pro8mm began building classic cameras with a new expanded gate, allowing for 20% more image to be captured where the old sound stripe used to be on the film. The development of modern aspect ratio products and scanning committed Pro8mm to be on board for the world of high-definition and the future. In late 2007, Pro8mm began purchasing HD Scanning Equipment and set up an HD Scanning Suite. Their Millennium II HD Scanner and 2K daVinci Color corrector gave Pro8mm the capability to move forward by both preserving archival material in HD or by directing scanning in native 1080 off the frame, and accommodating our production clients as all broadcast moves to digital. As a generation of filmmakers began to finish film school without ever shooting a frame of real film, 2010 brought the company to the realization that they needed to make a hefty commitment to education people on how to shoot on Super 8 film. 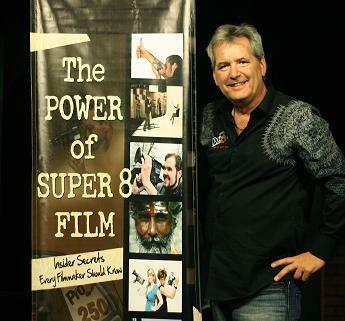 Company president Phil Vigeant wrote a book called “The Power of Super 8 Film – Insider Secrets Every Filmmaker Should Know” and the company began running free shooting events, teleseminars, workshops, and two-day Boot Camps for a nominal fee. Pro8mm is applauded for being a one-stop shop where Super 8 cameras, film, processing, digital mastering, hands on training and treasured family archival home movies can all be handled by a dedicated staff with decades of experience. The company has enjoyed continuous growth for over 40 years in a niche market that in our opinion exists at all because of the dedicated hard work and entrepreneurial spirit to continuously move forward in alignment with the media industry.